"Innosanto Nagara is writing a new kind of children's book. Besides being a fun, rhythmic, and lively text to read, the book's illustrations present a world of diversity and complex, inclusive beauty. We should shower our children, schools, libraries, and our communities with books like this one." "Meaningful change begins with doing small things at the local level, like picking up trash on the street, helping a neighbor, planting a community garden. Counting on Community encourages our children to embrace the power within each of us to create the world anew, to become SOLUTIONARIES." "At last, a counting book that will speak to all kinds of different people, living in diverse environments! Counting on Community has real-world content that breaks up stereotypes while teaching." "Counting on Community is a meaningful introduction to early readers about our innate power to contribute to our home, neighborhood and the world." "Few children’s books present a world in which kids and their families are so diverse, engaged, and vibrant. 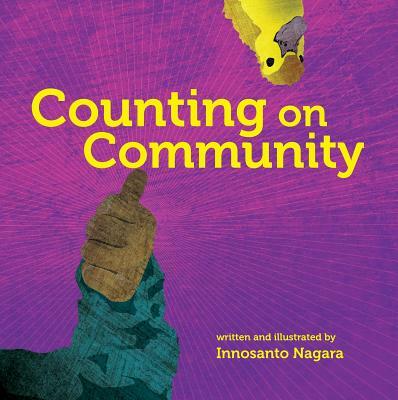 Not only is Counting on Community an endearing and beautifully illustrated book, it represents the best hopes and dreams for our communities." "...The decision to publish it as a board book could, in itself, be considered an act of taking a stand and giving voice. This is not a book adapted into a board book, but an intentional decision to create a space that values our youngest readers as those who should be invited into the conversation... [W]hat I think Innosanto captures so poignantly...are the little ways of showing up: shared meals, celebrations, making art and music, working and playing together. Because of this, and the the style of illustration that you describe, I am able to find my community (which is currently the middle of a rainforest in Panama) between these pages. These illustrations allow us to see ourselves and to consider the ways we contribute to and are nourished by our communities–or perhaps, the things we wish we paid more attention to."